VÍCTOR LUDEÑA: Listening friends of the CRE, we are here together with attorney Álvaro Noboa Pontón, with whom we are going to speak about various aspects having to do with the progress of his political party, the PRIAN. There will be a little something that has become a polemic, the issue with the IRS. The issue of the Assembly Members who are no longer with the PRIAN, also, but he has responses to the questions that we are going to pose immediately during this conversation with the man at the forefront of the PRIAN, Counselor Álvaro Noboa Pontón, to whom we give a welcome. Welcome to CRE, Counselor, good morning. Álvaro Noboa: Good morning, Ecuadorians. Thank you very much to the CRE for this interview, and to you Mr. Ludeña whom I know, respect and admire as a great journalist who has spent many years working in this area. I am ready to respond to any concern. Víctor Ludeña: First question, my own, and I’ve always want to ask you: why does a man who has economic power want political power? Álvaro Noboa: I already have political power, and I have economic power, I have healthy children, I have a lovely family, I have my health, I have everything a human being could want. Therefore, that generates in me a state of gratitude towards God, towards my country, which has allowed me to achieve all those goals, and what better way to thank all those Ecuadorians than to bring about their economic improvement so that they even become a middle class, like in Chile, like in the United States, like in Spain. Or that is to say, that the poor, poor become transformed into a middle wealthy class, which is something I see as very possible, that this middle class has it all. That the poor become middle class. That the poor have cement houses, they have cars, that they have a good health program, that they have safe neighborhoods, they have education. Knowledge is the major power that, in the modern age, man can have. That knowledge comes via studies, for which reason I aspire to all Ecuadorians being university graduates, or that they go to specialized technical schools. If we are a banana producing country, that we have the best school or banana production Institute here in Ecuador. If we are a rice producing country, that we have the best rice production Institute in Ecuador; if we are a shrimp producing country, that we have the best shrimp production Institute in Ecuador. Rice, corn, soy, all of those institutes should make Ecuador into specialists with large-scale production. Víctor Ludeña: But, aren’t we just talking about a theory? Because in real life, we’ve already seen some leaders, as well, that things just don’t turn out well. Álvaro Noboa: That they have a school to learn horticulture; that they have a school to learn sierra agriculture, like beans, vegetables, etc. Exactly, the greater part of politicians have failed in this mission because to do it, it’s necessary to have money. It’s as simple as that. And for there to be money in the country, Ecuadorian investors and investors from the world over have to bring that money to the country. Víctor Ludeña: Currently, not much money is being brought to the country. Speak of that, take a stab at that. Álvaro Noboa: I believe that, except for Grupo Noboa and a few other patriotic groups, the rest won’t risk bringing money at this time to the country. Víctor Ludeña: But are you aware, for example, that Rafael Correa’s has played the numbers, in regards to the price of petroleum, the taxes, the lowering of the external debt, it insures his work. Do you now give recognition to Correa’s work? Álvaro Noboa: I recognize that he has made roads with the money from petroleum, but I would have had that petroleum money and a hundred sources more of money from a hundred multinationals who want to come to the country, we would have a hundred times more money than Rafael Correa has had for governing. But in order for investors to come, the first thing that he has to do is to be friendly to them, not threaten them that he’s going to persecute them via the IRS. Because instead of skinning a group alive with income taxes, you charge them something reasonable as a group, and that will bring much more money to the state in order to pay for their social programs. Besides that, it’s necessary to have judicial security. One has to be able to go to court, in a country, and be able to litigate in an impartial way. Today, as it is in the case of Bananera Noboa, each time that a judge decides in favor of Bananera Noboa, they suspend him, they bring a penal case against him, and they go they threaten him with his denunciation. Víctor Ludeña: Attorney Álvaro Noboa, you have already brought up the issue of the IRS. Álvaro Noboa: No, I am bringing up the issue of judicial security. I am bringing up the fact that Bananera Noboa is an example of how in this country there is no due process, and that has happened in a lot of areas, with a lot of investors that have been badly treated by the Court system, by superior orders, many judges say. So what happens is that the people say I am not going to go to a country where they are going to expropriate my goods, where they are going to strip me of everything and what’s more, with the consent of only one judge or the consent of the Executive. So that is indispensable. It’s also indispensable that there be those hundred multinationals in the country, and that they bring the latest technology. That is to say that specialists in making photo cameras come here, or in making cellular phones, or that computer software specialists comes and that it is required by law for that knowledge to be passed on to the employees who work for that manufacturer. Víctor Ludeña: You are speaking like, for example, in Costa Rica. In Costa Rica they already make chips, but it’s part of an issue. You are already going into the educational issue, the topic of preparation. Álvaro Noboa: But education comes from two sources: training on the part of the multinational. That doesn’t take many years, it happens over three months, and by a profession that can take between two and five years, if it’s a technical school, two or three years, if it’s a university five or six years. Víctor Ludeña: But then from there departs the same fact that from the government it’s possible to orient one’s self. There are many people who are lawyers, Bachelor of Sciences in Communication, Economists, but there are no technical people. We’re missing technicians. Álvaro Noboa: Not only that, Ecuador is the greatest exporter of bananas in the world. It exports many times more bananas than Honduras exports. But nevertheless, the best university for banana production is in Honduras and not in Ecuador. If there were a great school for banana production, Ecuadorian banana production, which is very, very low, would be much higher. If there were here, on the part of the government, due process, assurance that there was not going to be – because they are always going around threatening to implement an agrarian reform, that they’re going to do this, that they’re going to do that, and so therefore the people don’t put much money in the farms. But if they knew that there was going to be a state guarantee to be able to, over many years amortize that agricultural investment, then they would do it with pleasure. That investment, together with the knowledge learned in the practical realm, in the technical school, at the university will raise productivity. When greater productivity, more profitability, more profitability, more demand for workers. What is the greatest demand for workers? Specialists. And what’s going to happen? By themselves, salaries are going to go up a thousand dollars. On their own. With a thousand dollars, a poor person can start making payments on a car, making payments on a cement house, he can begin to enter the level of the middle class. Víctor Ludeña: Now that you said the word enter. We have the issue of the IRS, an issue which at this time is being talked about. There are some who say, for example, that Álvaro Noboa has to pay what the IRS is demanding. There are others, those on your side, who say that it’s not fair what they are doing at the moment, there have even been objections made to Carlos Marx Carrasco himself, who is at the head of the IRS. To all this, Counselor Álvaro Noboa Pontón, the issue with the IRS and Bananera, are you continuing to be reluctant to pay what the IRS wants to collect? Álvaro Noboa: The issue with the IRS is laughable, and I find it unfortunate that of all the Press, no one puts any important questions to Mr. Carlos Marx. Víctor Ludeña: Like for example? Álvaro Noboa: Why do they want to collect $49,206,000 plus fines and interest that can reach $89 million dollars from Bananera Noboa in 2005, when from Dole they’ve only collected $700,000? $700,000! There’s something fishy there, or it’s political persecution. Because in that same year, from Chiquita, one of the biggest companies in the world, they collected $39,500 dollars. There’s something fishy there, or it’s political persecution. Why did they collect $14,000 from Reybanpac? There’s something fish there, or it’s political persecution. Why from Del Monte, did they collect $11,748, dollars. There’s something fishy there, or it’s political persecution. Because it doesn’t make sense to collect $11,000 from Del Monte, and $48 million dollars from us. Víctor Ludeña: When you say political persecution, you mean that suddenly, if you weren’t going to become a candidate for President of the Republic, that if you were not to run, or that you didn’t want to, would the political persecution of the company come to an end? Álvaro Noboa: His goal is to intimidate me, because in the year 2006 I beat Economist Rafael Correa in the first electoral round, and Economist Rafael Correa won the second round because he had five important parties supporting him: MPD, Pachakutik, the Izquierda Unida, Leon Roldós’s party, the RED, and Sociedad Patriótica, who given the freedom to vote, voted in large measure for him; except from the PRE. Those six parties, today, are staunch enemies of Correa. So, as I think I will make it to the second electoral round, and I have the hope of beating him in the first electoral round as I did in 2006, Correa has lost, because he is no longer going to have the votes of those six political parties that gave him the victory in 2006 in the second round. Víctor Ludeña: You are not one of those people who think, for example, the fact that you are a candidate, Lucio will be a candidate, Lasso will be another candidate, that the vote will be divided, and that we’ll find ourselves with what happened in Venezuela with Enrique Cariles, where the opposition after the primaries chose one man as a candidate, that you are looking at what happened in Venezuela, going up against Hugo Chávez. Álvaro Noboa: Well, I’ve not only gone up against my opposition, I have won against my opposition. I beat Mahuad, I beat Correa, but that is the past. Let’s look at the future. The future is an isolated Correa, it’s a Correa without friends, it’s a Correa with a Press that hates him, whereas the press in 2006 loved him. It’s a Correa that has two hundred bodyguards, policemen, security forces, he’s no longer the fresh young thing, the idealist; he’s a hated dictator today and that means that only 36%, according to the poll results I have here, are in favor of Rafael Correa, with one aggravating factor, which I’ll explain right now. There are 21% in favor of Álvaro Noboa. That is to say, that between us, we are the two in the first electoral round; there’s 3% for Lasso; for Lucio, 2%; for Alberto Acosta, 2%; but there are almost 40% that are still undecided. 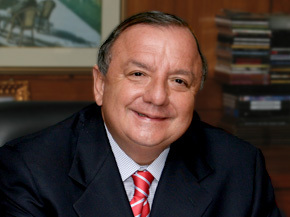 Víctor Ludeña: From whom are those poll results, Álvaro Noboa. I will also remind you of a phase when someone said that you were doing very well in the polls, but later it happened that it wasn’t like that. Álvaro Noboa: No, the reverse was true. Víctor Ludeña: Wasn’t it a Colombian? Víctor Ludeña: Yes, the things are like that, and you are doing well in the political party in regards to polls. Why have Assembly Members from your party had to leave? Álvaro Noboa: What causes me greater astonishment, because in this regard the Press is again always unfair because they never ask Correa, why ten Assembly Members have left him? Víctor Ludeña: 14 Assembly Members. Álvaro Noboa: 14. Now, see, but I’ve never seen you put that question to him. You never ask the Social Cristiano party and almost all their Assembly Members departed, yet I see that nobody asks them. No one asks Lucio Gutiérrez about the Assembly Members that he has lost, nevertheless, he’s lost more than five Assembly Members, one of them is in the newspapers claiming that when he turned in favor of Alianza País, they offered to make him a candidate in 2013, and now it appears that they are not going to make him a candidate…. that’s the Sociedad Patriótica. In every society there are honest people and there are scoundrels. Christ, who has been our God, and who has been an exemplary man, had his Judas. So what happens is that what is happening now is part of the corruption that the national government foments, because it is the national government which goes around all the time swaying votes through bribery. Víctor Ludeña: In your political party, then, there have been scoundrels? Treacherous people. Álvaro Noboa: Just like there have been in all the parties. Víctor Ludeña: You have not lost a lot, I say, with the absence of Vicente Taiano? Álvaro Noboa: No, Vicente Taiano doesn’t represent neither A nor B, and so that is all I can say in respect of him. I have a tiny opinion more about him, but I think it’s important to use the topic on other things. Like, for example, the convocation of the young, 18 years and older as Assembly Member pre-candidates for the PRIAN. As half of the population of Ecuador are young people, then therefore, they have the right to have representatives of the young in the Assembly. I have called on them to send their résumés to Wilson Sánchez Zúñiga, National Youth Director of the PRIAN, to this address: [email protected]. Víctor Ludeña: You are calling on young people to launch themselves as candidates, you’re speaking of that? Álvaro Noboa: Of course, from there we are going to choose the best and together with honest people that are already part of the PRIAN, make a choice list for the Assembly. Víctor Ludeña: This question can’t remain, and I’m going to insist again about the Assembly Members. Counselor Álvaro Noboa, you have already spoken about Vicente Taiano. There’s also Tito Nilton who left. Álvaro Noboa: But Tito Nilton is my great friend and a gentleman and I, as a friend, I have sent him a message to say that he should remain calm, that he’s taken the wrong measure, but Tito Nilton hasn’t gone anywhere, he will keep voting just the same for us. Víctor Ludeña: Isn’t it Vicente Taiano who is drawing them away? Álvaro Noboa: I don’t know what Vicente Taiano is doing, but he’s not worried me. Tito Nilton, I’m only saying, comes from one of the most serious families of Manabí. People from Manabí are very proud, they don’t accept treachery and Tito Nilton would never allow his headstone to say, “Here lies a traitor.” That is something Tito Nilton would never allow, and for that reason, Tito Nilton, if he’s got angry, if he’s become uncomfortable, at the time, he will continue voting for the PRIAN and will continue voting together with the opposition. A traitor, traitor is Wladimir Vargas, yes, he is one, going from the center-left school of thought, like the PRIAN, to an extreme left school of thought. But he comes from a caste of traitors; his father betrayed León Febres Cordero, his buddy, and Wladimir Vargas, my buddy repeated history by betraying me. Víctor Ludeña: We are becoming aware that you have been betrayed by your pals. Now, what happened with your nephew, Lucho Noboa? Was it only because of the issue that they went to lunch to the Carondelet. You didn’t know about it. Was that it, or were there already resentments? Álvaro Noboa: None. He was here yesterday, he continues to work in the Noboa companies and he is like a son to me. Yes, he made a bit of a mistake. I’ve turned the page. Víctor Ludeña: He’s going to return. Álvaro Noboa: He already returned. I am telling you that he continues working. Víctor Ludeña: The issue of the political party, the signatures, well, you submitted many more signatures and you must be calm about being passed by the National Electoral Counsel, or not yet, Counselor Noboa. Álvaro Noboa: You just said it, a brilliant man. We have approved, from the first time they gave us the party certificate, we have 185,000 signatures approved. And like in poker, we doubled, and we submitted 200,000 more signatures, so that if Correa would try in any way to disqualify the PRIAN, he would have no excuse to do so. Víctor Ludeña: In regards to Rafael Correa right now, what do you think of the President? What do you think of the money that you have to pay, or not going to pay in regards to the IRS? What do you think of Lucio Gutiérrez? 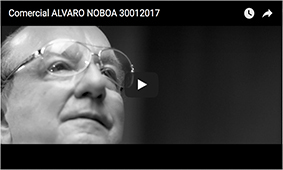 What do you think of the politicians who are your rivals, Counselor Álvaro Noboa? Álvaro Noboa: Mr. Journalist, I ask you please to not continue talking to me about the debts of Bananera Noboa when I’ve just shown you that from Noboa they want to collect a thousand times more, more than a thousand times more than from Del Monte. I see that this is just fool’s gold so don’t be fooled, go to Carlos Marx and ask him, say, “listen, Economist, what is the fishy business here in that you are collecting $11,000 dollars from Del Monte, what is the fishy business behind you collecting $14,000 dollars from Reybanpac, why do you want to collect $98 million dollars from Noboa,” and then we’ll see what he says. Because everyone asks me but they don’t ask him because they’re afraid they’ll be audited. Víctor Ludeña: No, no, I’m not afraid of Carlos Marx Carrasco. Álvaro Noboa: I ask you then, as an Ecuadorian, to put that question to him, and here I give your radio station the chart that you can take to him, and ask him, with this same chart, Mr. Journalist, ask Economist Marx, Carlos Mars, what he has to say. Víctor Ludeña: Carlos Marx Carrasco. Álvaro Noboa: Carlos Marx Carrasco. Víctor Ludeña: I see that you do it intentionally. Álvaro Noboa: Carlos Marx Carrasco, a fourth-level assistant, because first come—fifth! Because first comes the President, then comes the Vice-President, then comes the Minister, then the Sub-Secretary, he is a Departmental Chief, but he likes to figure in the press. He likes to threaten judges, according to the denunciations of the judges, he likes to be a protagonist, Carlos Marx Carrasco does. Víctor Ludeña: Thank you for being here, Counselor Álvaro Noboa Pontón and for speaking here in CRE. Álvaro Noboa: Thank you very much and I hope you invite me on another occasion during the campaign, because every week, every month, there are lots of new things in politics.